NCHS Library Media Center celebrates national award. 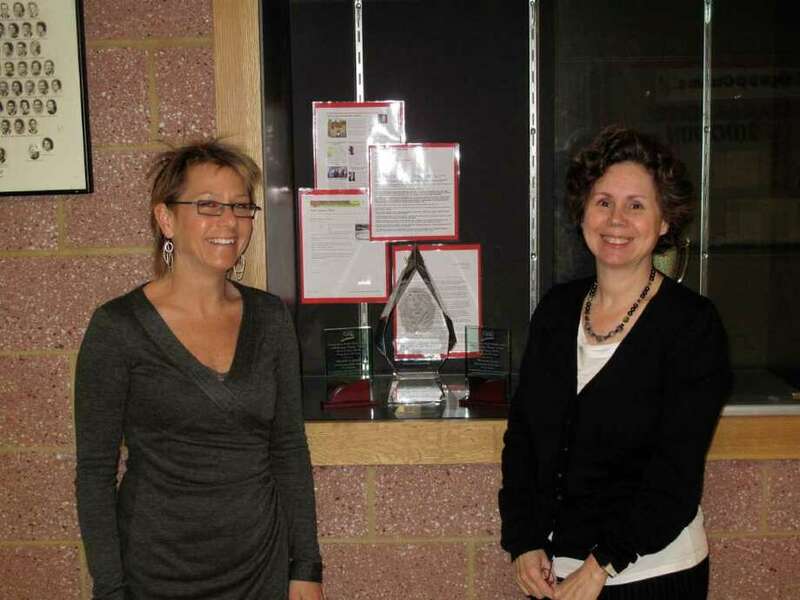 Michelle Luhtala and Christina Russo stand proudly with the NCHS Library Media Center's award. For a facility that just won a national award, the New Canaan High School Library Media Center looks oddly unassuming. In fact, throw those futuristic images of a quiet, cold, stainless steel area with emotionless faces reading "1984" out of your mind. The NCHS Library may not look hi-tech or futuristic, but it has been dubbed a 21st century library by administrators and others. "We read about 21st century learning all the time. They live it," Dr. Mary Kolek, deputy superintendent of New Canaan Public Schools, said. "It's not just a one-way relationship. They view students as creators and producers and that is just so unique." Last May, the NCHS Library Media Center was one of only two schools in the nation that received the 2010 National School Library Program of the Year Award from the American Association of School Librarians. "I spend more time here than any other place in school," Michael DeMattia, a junior, said. "The librarians here know what they are talking about and it is so much easier to access information." DeMattia also praised the media center's superior technology and book collection. "If there is something new then this place will probably have it," DeMattia said. "It is good because they promote the use of actual books in an age when their use is shrinking." While they do rely on the use of old school books, librarians Michelle Luhtala and Christina Russo still promote new and inventive ways to incorporate technology and social media in the learning process. The new award also gave the media center a $10,000 grant, which they have just begun to spend. "We conducted a survey with the students," Luhtala said. "They all wanted Macs." While purchasing the heavy duty Apple computers was not feasible nor cost effective, Luhtala and Russo did come up with a compromise. They purchased seven iPads and 10 iPod Touches. They plan on seeing how the students use the new equipment before using the rest of the money on one thing or the other. The benefit of these Apple products is their dual usage as a computer and an e-reader, Luhtala said. While they have not jumped completely head first into the e-book revolution, it is something they employ as a supplemental tool for their students. "It's not about equipment," Luhtala explained. "We use a lot more free technology in this place. We recently used Facebook as a discussion forum for a junior research project. Studies show that kids learn socially." Russo echoed her colleagues's statements. "We are constantly assessing how students learn," Russo added. "It is a 24/7 world we live in and we incorporate that knowledge into figuring out the best way these students can learn. We are focused on information literacy that is evaluative rather regurgitated." Still, while the award has given these media center some monetary rewards and shined a light on their methods, the award means much more than that for these librarians. "It means success for our program," Russo said. "It means that others actually recognize that our students are achieving." Kolek also commented on the verification of their success. "It's an acknowledgment of the quality of thinking and work that our library media specialists do." Kolek said. "Internally we appreciate that, but when you have a national review, it really is affirming." Luhtala credited much of the media center's success to the town of New Canaan. "We work in a really, really great community," she said. "There are great librarians out there but they are held back by a lack of resources. This is the kind of town that says, if you want to try something then go for it." Looks like that attitude paid off, in more ways than one.